A little prostrate Eurasian species, its smaller flowers on shorter pedicels making it less attractive than V. filiformis and V. persica. 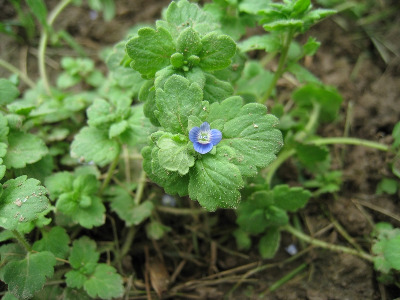 First collected in Ann Arbor, Washtenaw Co., where it is still a local weed, in 1870. Since then, becoming recognized as more widespread in lawns, cemeteries, fields, and disturbed ground. The mature pedicels are ca. (5–) 7–10 (–18) mm long, running shorter than in V. filiformis and V. persica, in which they are ca. 11–22 (–25) mm. Sometimes included in V. agrestis L., but the capsules of all our plants have very short eglandular hairs in addition to the slightly longer gland-tipped hairs, and the style distinctly exceeds the capsule lobes. The capsules of V. agrestis, known sparingly from adjacent Ontario, have only the longer glandular hairs, and the style equals or is shorter than the lobes. MICHIGAN FLORA ONLINE. A. A. Reznicek, E. G. Voss, & B. S. Walters. February 2011. University of Michigan. Web. 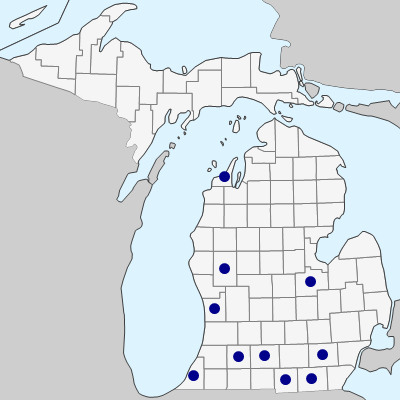 April 26, 2019. https://michiganflora.net/species.aspx?id=1983.